PVP is one of those polarizing topics for many players. Some people love it and may engage in organized PVP combat almost exclusively as their gameplay, and some people may have only set foot in a battleground when achievements force them to do so. If you fall into the latter group, Legion is bringing some sweeping changes to the way PVP works that may have you thinking about giving it another shot. The PVP changes will be affecting all of us in a positive way regardless, because it brings PVP-specific talents to the game. As balancing PVP and PVE content has historically been tricky and these changes should help whether you prefer PVP or PVE. 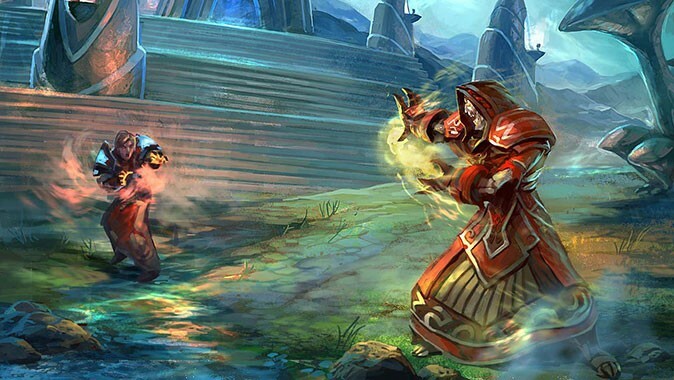 Everything from honor points, gear acquisition and talents will be dramatically changed. The connection between PVE and PVP content has always been somewhat contentious. An ability that’s too powerful in PVP might be nerfed to the detriment of PVE players. Talents always needed to be considered for these two — arguably very different — styles of gameplay. Now instead of being a currency for gear, PVP Honor Points will buy PVP-specific Honor Talents. And PVP gear? GONE! When players enter PVP, they’ll be given a set of stats specific to their specialization, regardless of what they have equipped. Honor Points will help you progress through the entirely new Honor Talents tree, active only during PVP combat. You’ll still have all of your regular class talents, and these talents work slightly differently. At each honor level you’ll unlock a choice in the next tier, but you won’t be able to choose freely between the three talents in each tier until you’ve unlocked them all. It looks like this, with the honor level of each talent next to it in blue, and the arrow showing the order they’re unlocked in. Once you’ve unlocked every talent in each tier at honor level 46, then you can choose freely between all three. The first four tiers of talents are general ones, and remain the same for all Mages. Tiers five and six are specific to each spec and so we’ll look at them separately. This tier deals specifically with loss of control and crowd control effects. Your first talent Gladiator’s Medallion provides you with a PVP “trinket” to remove all movement impairing effects and all effects which cause loss of control of your character. It replaces Honorable Medallion, a spell you will learn automatically upon first entering a battleground or arena. Adaptation is interesting because it’s like a trinket that automatically activates and has a reduced cooldown. This could be a tradeoff in cases where it might use the trinket when you wouldn’t have used it (or may have used another method of regaining control). Finally, the third talent to unlock here is Relentless, which reduces the duration of all incoming crowd control effects by 25%. This is again a very specific usage depending on preference – all crowd control effects are significantly reduced, but you can’t remove them entirely at will. The next tier of talents offers various methods of increasing your damage or stats. 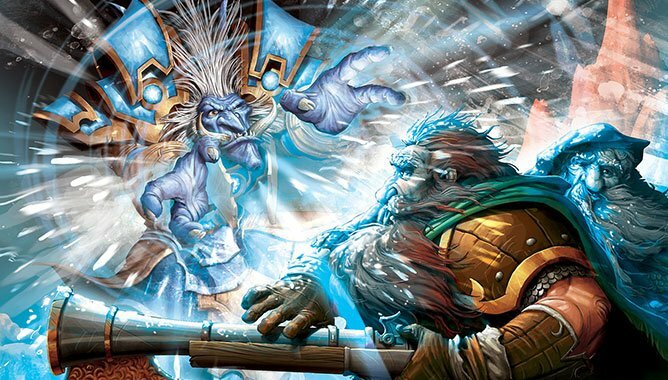 All three talents in this tier aren’t exclusive to Mages, and are shared among mostly other casters including Elemental Shaman, Balance Druids, Shadow Priests, and Warlocks. The first option earned will be Train of Thought, a simple 15% damage increase cooldown that’s lost when you are attacked. The next choice is Mind Quickness, increasing your haste passively by 6%. Finally, Initiation increases your critical strike chance by 30% on targets at or above 80% health. This tier is all about mitigating attacks or restrictions. The first talent is Netherwind Armor and it reduces the chance you’ll suffer a critical strike by 15%. Next is Burning Determination, which reduces the duration of interrupts by 30%. Finally, the last talent to be unlocked is Prismatic Cloak. Its effect is that after you Blink, spells have a 100% chance to miss you for 2.5 seconds. The first talent in this tier is Kleptomania, adding a fifteen second cooldown to your Spellsteal, but ensuring that it steals all spells from the target. This has some glorious potential for mayhem, for any Mage who has stolen Bloodlust/Heroism/Time Warp, now imaging stealing every buff your hapless target has as well. The next talent is Dense Ice, increasing the amount your Ice Barrier absorbs by 30% but making it exclusively absorb physical damage. The last talent is Temporal Shield which looks interesting. All damage taken while shielded will be instantly restored when the shield ends. This makes it a sort of immunity, though I can only assume it doesn’t do much if the damage you take ends with your death. Tier five for Arcane Mages starts out with Concentrated Power, altering your Arcane Power to last five fewer seconds but increase the damage bonus by 10% for some additional burst. The next talent is a blast from the past in the form of Torment the Weak. It increases your damage by 15% on enemies afflicted by your Slow or any movement slow effect. Finally, Time Anomaly seems like it could be powerful, although fairly random. Every five seconds, you’ll have a 5% chance to gain four Arcane Charges and Arcane Power for eight seconds regardless of its current cooldown. The tooltip says nothing about the likelihood of this happening while you’re by yourself with no one attacking at the Lumber Mill, but I’m guessing it jumps to 100% in that case. 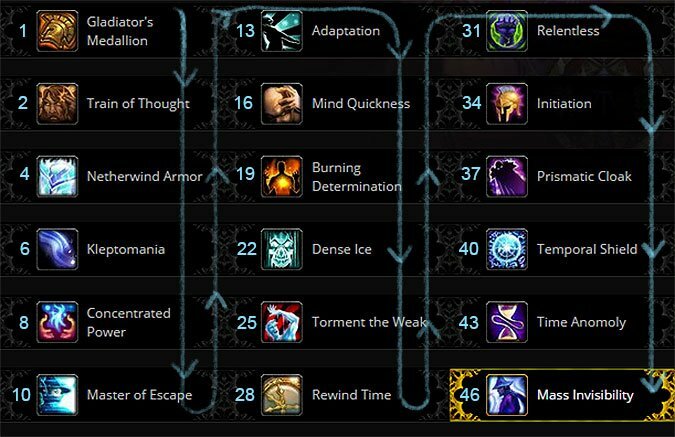 The final tier of Arcane Honor Talents is themed around invisibility and time manipulation. Master of Escape is the first talent, reducing the cooldown of Greater Invisibility by 45 seconds. The next choice is Rewind Time, increasing the duration of Displacement by 14 seconds. Finally, Mass Invisibility allows the Arcane Mage to extend Invisibility to all allies within 40 yards for 5 seconds. Like Greater Invisibility this is instant, and dealing damage cancels the effect. The Fire Honor Talents seem to be aimed at granting some benefit to a spec that’s typically been volatile to play in PVP. The first talent gives some snap to your Fireball. If you haven’t cast Fireball for eight seconds, your next Fireball will deal 30% increased damage and have a 50% reduced cast time. The next talent is another familiar face: World in Flames reduces the cast time of Flamestrike by 2.5 seconds and increases its damage by 30%. The last talent in this tier is Flare Up, which increases your Inferno Blast charges by one and makes it so that using Inferno Blast on a target that doesn’t have Ignite on it will actually refund a charge. The next tier of talents begins with Firestarter, allowing your Fireball casts to reduce the cooldown of your Combustion by twenty seconds. The next talent is Flamecannon, a talent quite unlike any we’ve seen before. After standing still in combat for two seconds, your maximum health increases by 5%, damage done increases by 5%, and spell range increases by five yards. The effect stacks up to three times and lasts for five seconds. The final Honor Talent is something to make any Fire Mage consider PVP — Greater Pyroblast. It’s like Pyroblast, only greater. It hurls an immense fiery boulder that causes 600% of spell power Fire damage. You’d expect that one of the most popular Mage specs for PVP would have some great talents in its later tiers, and Frost doesn’t disappoint. Chilled to the Bone adds a damage component to your Frost Nova and your Water Elemental’s Freeze when the effect ends. This damage is doubled if either of those are dispelled. The next option in this tier is Frostbite, giving your Chill effects a 15% chance to freeze the target for four seconds. Random freezes are just what a Frost Mage enjoys. Lastly, Deep Shatter replaces Fingers of Frost with an additional 200% damage to Frozen targets. The last tier starts out with a talent that should speak to every Mage’s heart — Concentrated Coolness. We’re already specced into that naturally, but this talent gives Frozen Orb a cast location within a forty yard range and it no longer moves. Its damage is increased by 20%. Next up is Burst of Cold, allowing your Frost Nova to reset the cooldown of Cone of Cold and increase its damage by 50% for six seconds. The final Honor Talent available for Frost Mages to earn is Ice Form, and it sounds amazing. Your body turns into ice, increasing your Frostbolt damage done by 50% and granting immunity to stun and knockback effects. It lasts twelve seconds. The new Honor Talent system should be very beneficial for Mages looking to customize their gameplay in PVP. The scope of this article didn’t allow me space to talk about the Prestige system, either. If you’d like to read more about the general changes coming to PVP, you can read the full PVP preview for an overview.